With Christian Hackenberg breaking freshman passing records and making most of the headlines as Penn State prepares to face Central Florida, we look back at the Nittany Lions’ two previous meetings with UCF—and at the guy whose rookie QB record Hackenberg recently broke. 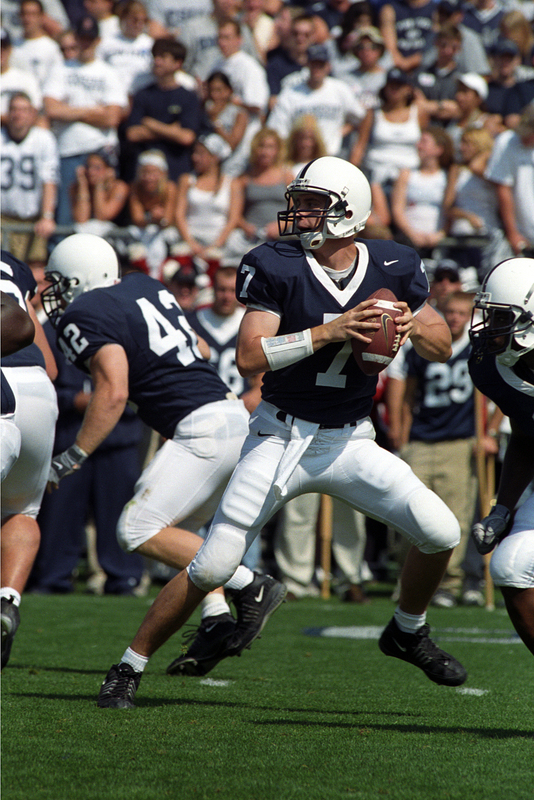 Zack Mills ’04 was Penn State’s starter in each of the Lions’ victories over UCF, the first a season-opening, closer-than-it-should’ve-been, 27-24 win in 2002. In The Football Letter the following week, our John Black ’62 described Mills, then a sophomore, as “calm and comfortable leading the offense, as he completed 13 of 20 passes for 194 yards and two touchdowns with no interceptions.” The second meeting was a 37-13 rout in 2004, in which Mills, then a senior, threw for 229 yards and a score. Those games took place during one of the more difficult on-field runs in program history. Mills battled injuries and inconsistent team play in that stretch, and, as the signal-caller, caught more than his share of criticism when the Lions struggled. But he was also responsible for some truly memorable moments, particularly during his freshman season in 2001. Like most Penn Staters, I first watched Mills (below) in the 2001 season opener, when he came in for an injured Matt Senneca ’02 against a phenomenally talented Miami squad. The Hurricanes won 33-7, en route to a national championship season in which they were rarely tested on the field. It was an ugly night for the home team, and yet I have great memories of being at that game. One had to do with sitting in the brand-new upper deck above the south end zone—it was the first game at Beaver Stadium’s peak capacity of 107,282, and officially, there were more than 109,000 of us squeezed into the building that night. Of course, the best and most lasting memory from that night remains the sight of Adam Taliaferro ’05 walking onto the field before the game. There wasn’t much worth remembering from the game itself, but for me, the one thing that sticks out is the sight of Mills, a true freshman, unexpectedly pressed into action against a ferocious defense loaded with future NFL standouts. He completed 12 of 24 passes for 240 yards and a touchdown in a valiant effort off the bench. Almost two months later, Mills starred in one of the most unforgettable games I’ve ever witnessed. The epic comeback against Ohio State gave Joe Paterno his 324th win, and it was Mills’ all-around performance—highlighted by a hurdling, pinballing, momentum-shifting, 69-yard touchdown run—that carried the Lions to an unlikely 29-27 win. It was almost an afterthought that Mills also threw for a freshman record 280 yards on the day. 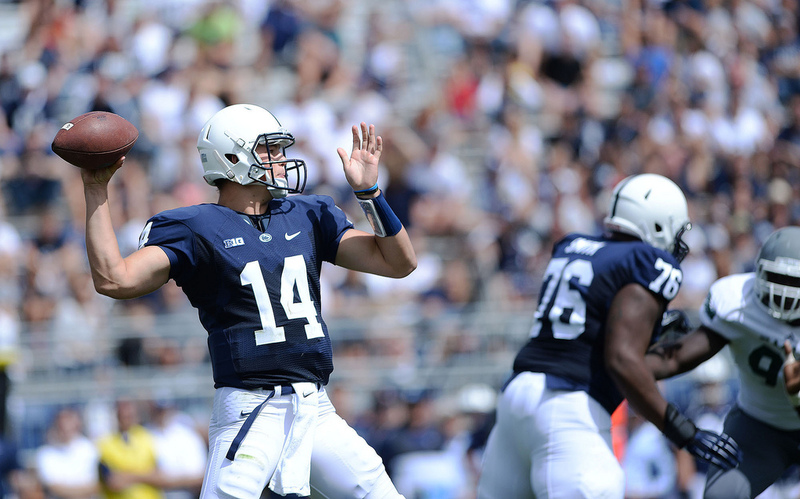 Last Saturday against Eastern Michigan, Hackenberg obliterated Mills’ single-game rookie record with 311 yards through the air. Given his poise, size, and NFL-caliber receiving options, I doubt anyone would be surprised if Hackenberg resets his own record a few more times this fall. If he did it against the Knights this Saturday, I’m sure no one would complain. This entry was posted in From the Archives and tagged Adam Taliaferro, Central Florida, Christian Hackenberg, Eastern Michigan, Joe Paterno, John Black, Matt Senneca, Miami, Ohio State, Zack Mills. Bookmark the permalink.